March 31, 2017 - Like us now! Today we are going to take a look at Zong Internet Packages which include Zong 2G, 3G & 4G Internet Packages. Zong or China Mobile Pakistan (CMPak) is a 100% owned subsidiary of China Mobile Communications Corporation. Zong engages in the provision of cellular mobile voice and data services to the Pakistani market through 2G, 3G and 4G technologies. The high standards of performance are testified by the service award of “No.1 Operator in voice and data services” by the Pakistan Telecommunications Authority (PTA). Zong has over 26 million subscribers and a market share reaching 20%. Currently, the 4G coverage extends to over 100 cities of Pakistan and this number is increasing day by day. Previously, we talked about Zong Call Packages, Zong SMS Packages, and Zong 3G/4G Internet Settings. Zong also provides a diverse range of affordable 2G, 3G & 4G internet packages at different rates to its customers. Here are the complete details of Zong Daily, Weekly, Monthly and other 2G, 3G & 4G internet packages. Following are the two Zong Prepaid Daily 2G, 3G & 4G Internet Packages/bundles. *Out of bundle rate: If a user does not purchase an **add-on after volume consumption of data bundle, he/she will be charged an out-of-bundle rate of Rs.1/MB till the validity of the bundle, instead of default rate of Rs.4/MB. **Add-on: These are small bundle increments that can be purchased after volume consumption of data bundle, to enjoy seamless 3G/4G experience. SMS ‘ba’ to 6464 to activate 100MB Basic Add-on for Rs.10. Zong offers Weekly Premium and Super Weekly 2G, 3G & 4G Internet Packages at different rates. Zong provides data, on-net minutes, off-net minutes and SMS in the All-in-1 2G, 3G & 4G Internet Packages/Bundle. Dial *6464# and press 4, then follow the menu. Zong also offers Social 2G, 3G & 4G Internet Packages for Facebook, Twitter and WhatsApp usage. If you use the internet without subscribing to any data bundle, default rate of Rs.4+Tax/MB will be charged. Other Zong Prepaid 2G, 3G & 4G Internet Packages include Good Night Offer (GNO), Day Time Offer (DTO) and WhatsApp Daily Bundle. *Maximum duration of WhatsApp calls: On average 300KBs/Minute is consumed on WhatsApp voice calls. This translates to up to 17 hrs of voice calls daily! With Zong Data Share, you can share your 2G, 3G & 4G internet data packages with upto 10 friends and family members. All members can simultaneously enjoy mobile internet. Only ONE person has to buy the data share bundle, whereas all the added group members can enjoy it without any charges as long as the subscribed data share bundle volume is available. Step 3: Add member(s) & start sharing! In addition to Zong 2G, 3G & 4G Internet Packages, it also offers Facebook Flex which is the unique feature that allows Zong users to stay connected with Facebook even with zero balance. Flex feature allows users to switch between DATA mode and FREE mode of Facebook. Free Mode: Zong users can enjoy Facebook even without balance by switching to the FREE mode, in which they will be able to post statuses, likes, comments, chat, check-ins, send friend requests. Data Mode: In order to view rich content such as videos, HD photos and external links, customers can switch to Data Mode and they will be charged as per their data plan. Zong and Facebook have launched a joint initiative of Free Basics in Pakistan, which gives access to a range of 50+ free services covering range of categories including news, health, travel, jobs, sports, education, services for women, and entertainment. You can access free Facebook from any web browser on your phone, or using the Facebook app for Android phones. You can download the Facebook Free Basics app, here. Zong offers 2G, 3G & 4G Internet Package exclusive to UC Browser users. UC browser is an App which helps to load web contents more faster than a normal browser. This bundle is only available on UC browser, so it is mandatory to download UC browser App for subscription. Just dial *102# to view bundle usage. Other than Prepaid Internet Packages, Zong also offers a number of Postpaid 2G, 3G & 4G Internet Packages to the postpaid customers. Email Subscription Method: You can receive your bill for Free by email, simply send EBSUB your complete email address to 3100. For change of email send SMS “EACNew Email Address” to 3100. Email Un-subscription Method: If you would like to unsubscribe to FREE Email bill service, simply send EBUN to 3100. Two billing cycle starting from 1-30/31st or 16-15th of the month are available. Line rent will be charged on full for first month. Besides above-mentioned Zong 2G, 3G & 4G Internet Packages, there is also a special SIM available with a variety of Zong 4G Internet Packages. Internet SIM is a ready to use SIM, just put it in your device and start using the internet. This SIM is specially designed for the Dual SIM handsets, it also compatible with open market MBB devices, Tablets, laptops and any other internet compatible devices. (Note: Internet SIM supports all internet enabled devices subject to compatibility). You can get this SIM from the nearest CSC/Franchise or Retailer in 3G/4G Cities. 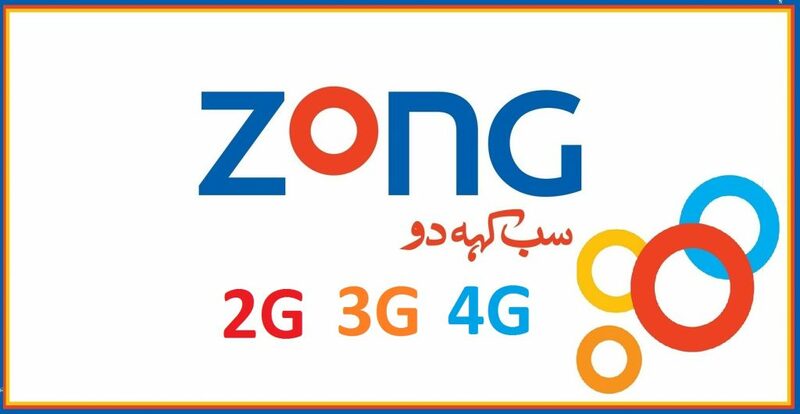 Make sure that Zong Internet SIM is inserted in the 3G/4G slot of the dual SIM handset or any other device, there is usually one slot for the 2G and other for 3G or 4G in a device. Internet SIM is 4G SIM by default and all the bundles are 4G and if you have a 4G device then you enjoy the blazing fast speed of 4G. It also has fall back option of 3G/2G depends upon the device and the coverage area. Dial *6666# from your Internet SIM. This was all about Zong 2G, 3G & 4G Internet Packages. If we have missed anything, do let us know in the comments below.